That might be the most unexpected thing to see after experiencing what you've feared most in life. I just experienced my first kidney stone. There are certainly more painful things to experience, but I'd seen more people go through this than anything else. So many had said it was one of the most painful things they had lived through. I wonder if living through your worst fear makes you see so clear. Or was it drinking so much water, Yoga, and having watermelon and pomegranate. Watermelon, pomegranate, rice and "kidney" beans can help dissolve a kidney stone. Sometimes dissolving a problem is better than forcing it out. I wonder if kidney beans are called that because of what they remedy. While you’re in excruciating pain--in your worst fear—you start to think of many things. Is this what it is like to give birth? Is this what the end of life feels like? How much pain can I take? Can the mind control what you feel? The pain then causes you to move on to other thoughts. I wish I had jogged this morning. Or, why did I eat that extra pork chop last night? Restlessness is one of the symptoms of a kidney stone. Who knew! I hesitated to post anything on Facebook. I don't fashion self-pity. But I was curious to know what everyone did in this situation. Hmm..."water"...or "beer"...to piss this away. Moving around helps relieve the pain. I started to think of Neil Peart and his 55,000 mile motorcycle journey after his wife and daughter died. Motion was healing, he said. Then I wondered, was this the end? I started to reflect on things I had done or hadn’t done. It felt so special to have had such good friends in life and a beautiful child. I wanted to love again. Travel the world. I was in my thoughts. I was just working on the estate of my Dad who recently had a kidney stone and wondered was this a sign? I wrote my sister to give everything I was about to inherit from my Dad to my child. I thought of a few others too…but there was no time to think of everyone and write it out. Pain limits what you can think. I thought of my business partner – and the work we had painstakingly done in the past year to gain our position. What would become of this? How would it carry on? Life is indeed short. You can’t take your timeline for granted. Steve Jobs didn't take his timeline for granted. In the last decade of his life, he launched Apple Stores, iPod, iPad, iPhone...and changed the music industry with iTunes. Who does that past midlife or even in one decade while young? No one. I had just read about Steve Jobs getting his kidney stone while being a rare CEO of two public companies - Pixar and Apple. 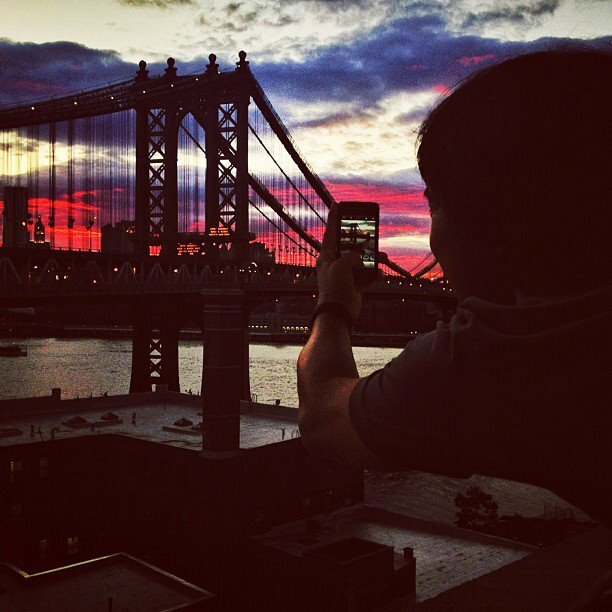 I thought of a beautiful picture I had just shared of the Manhattan Bridge taken from the Gothamist office in Brooklyn. I wondered would this be the last photo I posted? No one ever expects any post to be the last. I was grateful for having been a guinea pig student to a yoga teacher to know how to do some poses (feet above the head) that help flush out a kidney stone. I had the symptoms too…sweat, chills, and occasionally nauseous. I thought of things like how could the water cooler be in such an inconvenient location….this probably indirectly curbed my water intake. I wondered why my Wi-Fi was blinking on or off. Why now – when I needed to look up stuff most. The iPhone was comforting to have in this situation—small enough to carry while you’re in any position. I was grateful a New York conference call was postponed. I also wanted to tell someone who felt unresolved to feel better. At the same time, you start to see how meaningless many things are…the only things that matter is making good history and making good people happy. There was no grey in this ordeal. Everything was straight up. Then after 4 hours, it was done. I was feeling good. And I felt so lucky. A pain much shorter than normal was gone. I started to see clearly again. I felt like running. My adrenalin shot up. Life was real again. I wondered if this is what a mother feels after giving birth.